Rainbow Star Dream Catcher. Brightly colored feathers, strands and beads! 7.75"dia x 21"L +3.5"hanger. 3pc minimum. Must order in increments of 3. 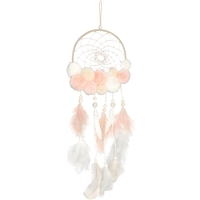 Pink Tassi Dream Catcher. 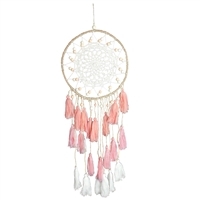 Macrame dreamcatcher with pink and white tassels. 8.5"dia x 21"L+hanger. 2pc minimum. Must order in increments of 2. Little Sprite Dream Catcher. 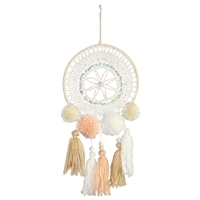 Macrame dreamcatcher with rainbow sequins and pink, beige and white pom poms.3pc minimum. Must order in increments of 3. 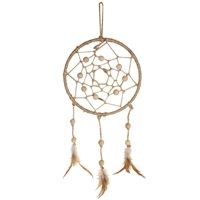 Desert Sands Dream Catcher. Earth toned feathers and pom poms. 6"dia x 17."L+2.5"hanger. 3pc minimum. Must order in increments of 3. Price shown now nearly 50% off! 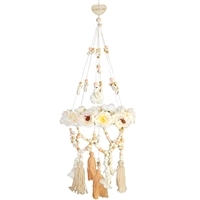 Pure as snow dream catcher with tassels and beads. Large size. All black with 3 dream catchers, feathers and ribbons. Charming little deer suncatcher and mobile with bead strands. Price shown nearly 50% off! 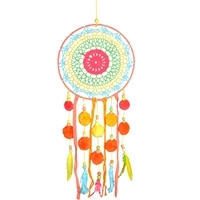 5 dream catchers with rainbow feathers and beads. 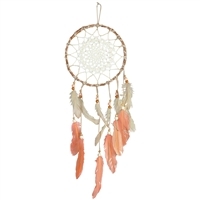 Neutral toned jute and bead dream catcher. 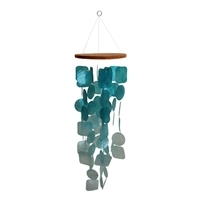 It's always Summer with the soft island sounds of capiz shell chimes. Featuring colors reminiscent of a tropical sunset. Its always Summer with the soft island sounds of capiz shell chimes. 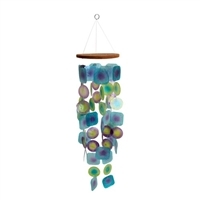 Blue and purple glass chime with beads! 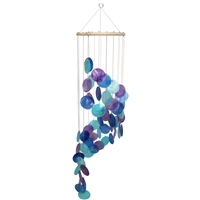 Suncatcher glass chime with lots of color and beads! 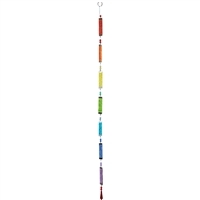 1 Dozen colorful rainbow glass strands. 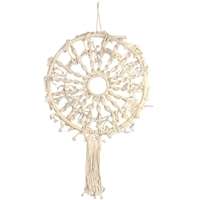 Natural willow dream catcher with wood aqua beads and white feathers. 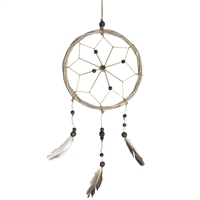 Minimalist boho dreamcatcher with black beads and neutral colored feathers. 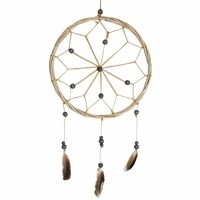 Minimalist boho dream catcher with black beads and neutral colored feathers.